Roland Schmaltz is heading back to Germany in a few days, but not before trying to capture one more NY Masters title! We had one newcomer in Evgeny Margulis, an 11 year Brooklyn resident who has not played in a tournament in quite some time. It’s nice to see him removing his rust at the NY Masters. This week also had two qualifiers, as the blizzard made it impossible for David Zimbeck to play in last week’s event, and due to the extenuating circumstances, we let him play this week instead. Enough talk, let’s get to the games! 1. Furdzik - Stripunsky SEE BELOW! One of our qualifier’s provided this round’s only upset, as the great doctor, Lew Eisen, went down to talented younger, Alexander Pelekhaty. Pelekhaty attends the same school as Alex Lendermann, so we can imagine these two are studying and playing a lot together! Last time that the game Furdzik-Stripunsky was relayed, Furdzik won in fantastic, sacrificial fashion. Would the GM turn the tables this time? 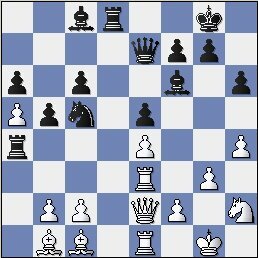 Capturing on f4 and playing ….f5 is blacks typical response in such Closed Sicilian type of positions. It looks like whites play on the kingside isn’t going anywhere (especially since none of white’s pieces are on the kingside), meanwhile black has achieved a comfortable setup. This is one of Stripunsky’s great strengths. He is never scared to mix up the game and has a good sense of when it is correct to do so and when it is correct to use safer means to get the point. 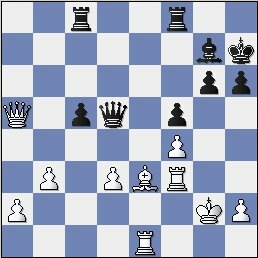 36...Qh5 would have led to an even faster victory, although white can no longer resist the black onslaught. 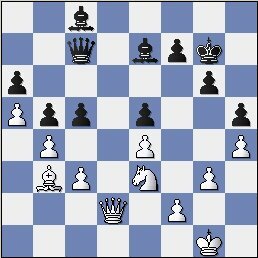 37.Bf2 Qh5 38.Ke2 Rg2 39.Qc7?! Maybe something like 39.b4 is a better attempt. 2 D’Arruda – Schmaltz SEE BELOW! Our qualifier, Alex Pelekhaty, keeps on rolling! 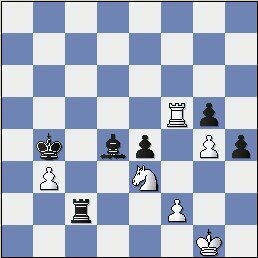 He had to be happy to draw strong master, Rafal Furdzik, with the black pieces. Stripunsky defeated Bonin, as he did about 25 times in a row before his loss to Jay from a month ago. My encounter with Margulis was exciting. I learned very quickly that Margulis had an attacking style, as he sacrificed material to keep my king in the center. After fending off the initial storm, my threats were too great and I was able to move to 2-0. Not the most action packed of chess positions, it seems as if Ricardo was in a peaceful mood today, however Roland is not going to share Ricardo’s peaceful demeanor. Now we have a situation similar to last week’s game, Benen – Schmaltz. A completely equal endgame has arisen, yet Schmaltz will do all he can to show why he has the best record of anyone in the NY Masters. 15.Rfd1 Rac8 16.Nfe5 Bxg2 17.Kxg2 Nd5 18.Nd3 Na4! A great attempt to make something happen in this otherwise dry position. Already we are beginning to notice that black is controlling the game. He has the only bishop on the board and is starting to gain space on the queenside. 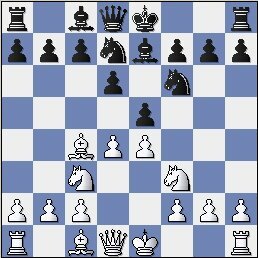 Can D’Arruda play accurately enough to avoid going down to the “GM” technique. Black has an advantage here. 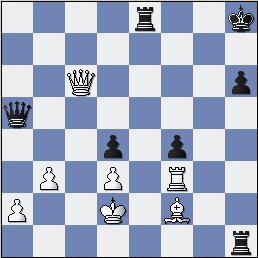 It seems like white has the passed pawn, but this “advantage” pales in comparison to blacks active rook, constant threats upon the f2-pawn and the eventual weakness of the b3 pawn. However the advantage is not large at all, so the result is still very much in the air. 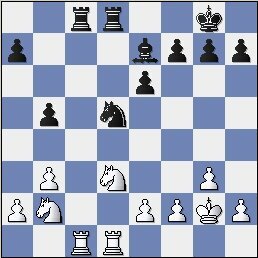 30...h5 31.h3 Bb4 32.Rd1 f5 33.Kf1 Kf7 34.g4 fxg4 35.hxg4 h4 36.Rd3 e5 37.Rf3+ Ke6 38.Nb6 Bc5 39.Nc4 Bd4 40.Kg2 e4?! Roland was not happy with this move, as he felt that it made his e-pawn weak later in the endgame. D’Arruda exhibited very nice poise under pressure in this game, and has finally achieved a solid, drawn position. Roland seemed to think that he had a very large advantage at some point during the endgame as his comment to me was “My endgame technique is non-existant”. However I think that one can be excused for not winning this position as there was never any clear knockout blow. 1 G.Shahade – Stripunsky SEE BELOW!! Pelekhaty has had a fine result to this point, but the black pieces against Schmaltz is no picnic. Schmaltz took care of business, and waited to see the result of my game with Stripunsky. 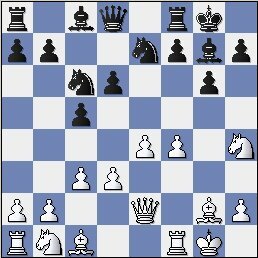 Roland Schmaltz recommended this move to me, as I got a stupid position in our game the previous week with 7.Nb3. Also I lost like a child against Stripunsky 3 weeks ago with 7.Nb3, so I really didn’t want to repeat this line. Oh goody free pawn. 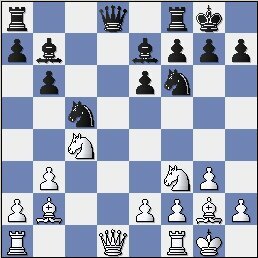 While analyzing the opening, Schmaltz also said Ne7 was impossible because of Bb5, thus allowing me to blame the entire loss on him. Bb5 wins a pawn but at a terrible cost. Black’s bishop on b7 becomes a monster, and my bishop gets shut out of the game on g3. 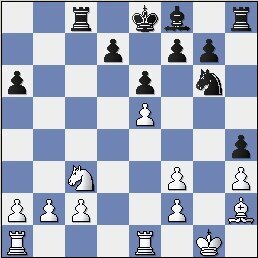 11...Ng6 12.Bxc6 Bxc6 13.Bg3 h5 14.h3 h4 15.Bh2 Qb7 16.Qd3 Rc8 17.Rfe1 Bxf3! 18.Qxf3 Qxf3! Resisting the temptation to go pawn grabbing on b2. No this is not a misprint, that is my actual pawn structure. Don’t try this at home. The good news is that in return for the ugliest pawn structure in the history of chess, I also have a bishop that has ZERO squares to move to. All of this means that my pawn advantage is more than meaningless. Now it was dawning to me that there was no chance to defend. The king will either go to g4 via f7-g6-h5, or if I stop that maneuver, the king will come towards the queenside, as in the game. 1 Stripunsky (3) – Schmaltz (2.5) SEE BELOW! This was a very lucky round for yours truly. I had a very equalish/slightly worse endgame with Benen, but was able to putz around and create enough tricks to end up winning in a long endgame. Privman also had to be happy with his last round win over Jay Bonin, good for a 3/4 score. Privman received a major gift in round 3, as he had a knight and some pawns against Lewis Eisen’s queen and pawns, yet managed to win the game by forking the king and queen! The matchup we have all been waiting for! The two GM’s finally meet in the final round. 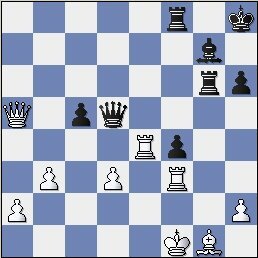 Schmaltz needs to win with the black pieces against a strong GM like Stripunsky, a very difficult task. 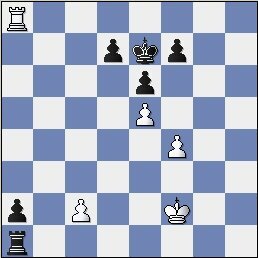 I recall a few similar situations before where players needed to defeat Stripunsky with the black pieces. Yudasin got a worse position after 15 moves and thus agreed to a draw. Maurice Ashley was in the same spot but went down in flames to Stripunsky’s attack in that game. If anyone could take Stripunsky out, Schmaltz could do it…. Yeah, everyone knows it’s a great idea to play the Philidor Defense when you are in a must-win situation! Actually the Philidor is known as one of the most passive openings in chess. 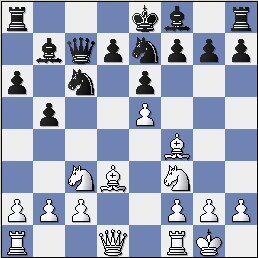 Strange that Roland decided against playing the Sicilian in this must win-situation, especially since Roland stated that he was going all out for the win. Schmaltz has done a fine job of confusifying the position. It turns out the Philidor has fangs after all! 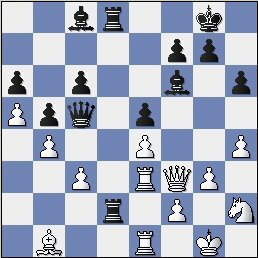 Black has a more active and aggressive setup, yet will it be enough for the win? Wait, look at this, Stripunsky has created Alekhine’s gun, with the Re3,Qe2, Re1 setup!! The only problem is that this technique is usually most effective on open files. Schmaltz has to be commended for his play as it seems that black is in control here. His rooks are much more active than white’s and he has the 2 bishops. Stripunsky has an unpleasant task of defense ahead of him. Stripunsky is finally positioning his pieces in the center of the board. 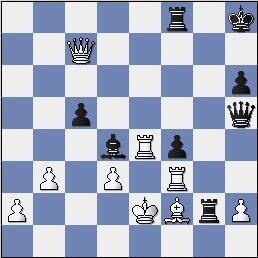 He is trying his best to eliminate the initiative of Schmaltz, but black still has the more active play, with a later ….c5 push coming. At last Stripunsky has contained blacks initiative. 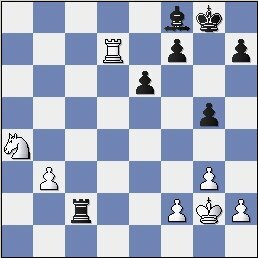 The position is too simplified and white has no real weaknesses anymore. The d5 square is also mighty tempting for the knight. The draw was agreed and Stripunsky clinched first place. 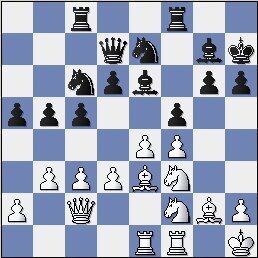 Roland did a great job of trying to stir up some winning chances with the black pieces, but Stripunsky was just too hard to break. With this draw, Stripunsky locked up the $350 first prize. Schmaltz, Privman and I all tied for 2nd place, good for just about $100.